Another surprising example was the Creeping Juniper, where a burst of green vegetation appears at the end of a long dead stick lying on the ground. However, underneath what is seemingly a dead branch, a small, concealed strip of live bark and tissues carries nutrients way out to the end of the plant, which can be found further away on the ground. Another neat story was about some of the first Limestone Barrens plants being brought to the MUN Botanical Garden to be grown there. But being so adapted to their harsh environment, when they were placed in rich, healthy soil at the Gardens, they grew too fast and promptly died. In Gene’s words, “I guess they don’t like being too happy”. Hearing the stories of how he lay down to photograph all of these tiny rare plants was fascinating too. Apparently people would come up to him asking “Have you had a heart attack?” and his wife Karen would have to keep explaining “He’s not injured, he’s just taking pictures”. The white ‘frosting’ on the plant is actually calcite (calcium) crystal excreted by the leaves. What a stunning little plant. 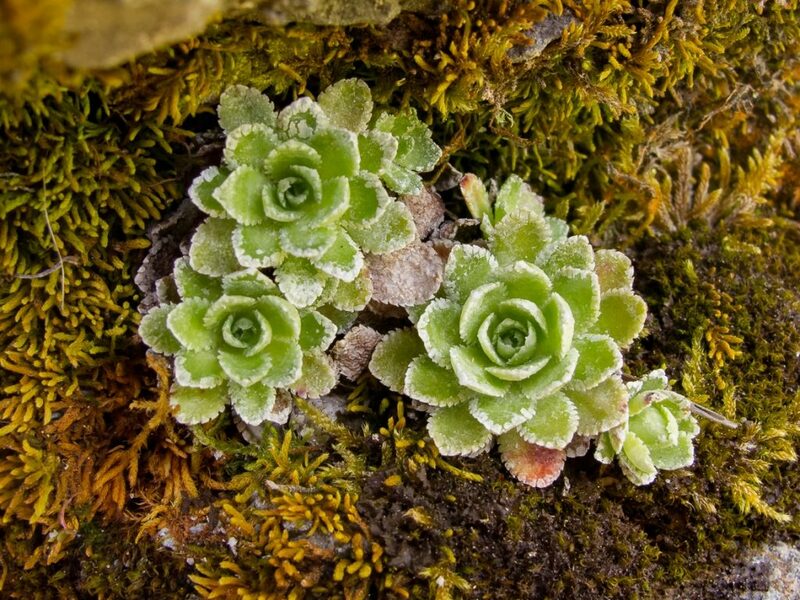 You can imagine the scale from the photo – the saxifrage is only a touch bigger than the moss that surrounds it.